I think I fell in love.. at first sight.. with this book. I finished reading it with happy tears in my eyes. It made me sad, it made me happy, it made my heart race even though there wasn’t too much action, but the amount of emotions per page were definitely too many for my heart to handle them properly. This book went from the ‘must read’ shelf to the ‘most beautiful romances’ shelf in a blink of an eye. I was caught up in this story without knowing – one moment (around midnight) I started reading it, I struggled with understanding Hadley and her problems with her father, and then I don’t remember how the time passed and it was 5:30 in the morning when I virtually turned the last page of my kindle and I was deeply in love with this story. 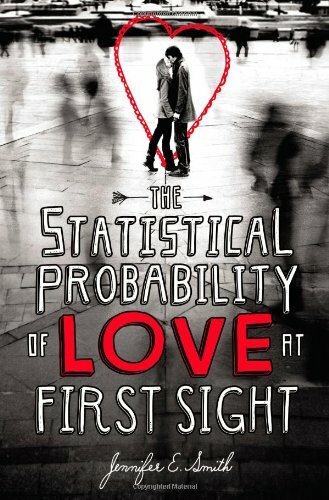 I thought it was supposed to be a fluffy read about love at first sight, as the title and the description of the book are a bit misleading giving you a hint in this direction. So I was prepared to laugh and maybe to care a bit about Hadley and Oliver. Still, nothing prepared me for the beauty and the dramatic turnarounds of this story. Of course I saw it coming, from the brief discussion on the plane, but that’s how amazing this story is, because even though I knew what I was bracing myself for, it still made me shudder, it still made my eyes tear of emotions. In the end, it’s not the changes that will break your heart; it’s that tug of familiarity. Carousel is not a strong enough word… I need another one, one more powerful, holding more meaning. Because this story is not light at all, it’s heavy, so heavy that it holds my heart to the floor, and it made my soul ache. There was this big gap between all the happy moments and memories (the time spent in the plane full of joyful talks) and the drama behind it all, and the meaning of so many phrases that at first sight didn’t seem to mean more than what you can hear, but at the end, there was much more to them. You know, kids usually think they have the right to choose a destiny for their parents. They think that because their parents love them, they must condemn themselves to a life of misery and unhappiness only for the good wealth of their children.. But this is so not right, in so many ways. Kids grow up. You have them with you for like 20 years and then they fly away to a better life, to their own life. So I would never judge the couples that decide that they no longer have to be together, that decide that they need someone else to be happy with.. It doesn’t mean that they don’t love their kids anymore, it just mean that they need to find their own happiness too. This being said I couldn’t relate to Hadley’s pain. For the last past 2 years Hadley kept her father away. She didn’t want to be part of his new life and she didn’t want him in her life. She thought that if he had chosen to be with someone else, she was better off. But then, it seamed that her own decisions were the ones that made her impossibly unhappy, because she suffered for not having him in her life anymore. It was a personal, inside fight without an ending, and it hurt her more than she knew it could. Still, I loved how she understood that she was the one making a big mistake, that he was “still her father, the rest was just geography” and that there were worst places to be on a summer weekend than a weeding. Off course she wouldn’t have understood it if it weren’t for Oliver, dear sweet Oliver. I loved this guy – he was cute, he was funny, he knew how to enjoy life even at it’s worst, he was so caring and nice that you would like to meet him in person. Yes, he is the reason Hadley made up her mind.. Finding that others might suffer as well, that other might have bigger problems helped her understand that she was exaggerating in her pain. Pain is relative; we might suffer as much from the very wrong and different reasons. What counts in the end is the lesson we’ve learned, how it might change us. In all the drama, the sweet love story seemed like the sunshine after the torment. It was warm, and sweet, and it made me smile. I loved the moments on the plane, their conversations, their brief jokes, and their shyness. I loved how, minute by minute, they got closer, and closer, one kiss away from each other… I loved how they found a way to be there one for the other, every time they needed it… I loved how they fell in love, and how they made me love their love story. Reading this story felt like falling in love for the first time. As warm as a summer rain, as bright as the sunshine, as beautiful as a rainbow, as light as a flight, as fluffy as a cloud, as colorful as fireworks, as soft as a kiss.. Because this is what love at the first sight feels like 🙂 Enjoy it! Note: The Romanian version of the review can be found here. Wow, I keep hearing either raves or pans of this book, and I’m mighty curious! Guess I’ll have to pick it up and find out for myself sometime. 😉 Nicely reviewed! I know! When I started reading it everybody seemed to love it, but today I had a hard time writing down my review as I read a lot of negatives reviews in the past few days. Glad that I took notes with what I felt when I finished it, LOL. Oh I LOOOVED this! Glad you did too it was so cute and just heartwarming. I’m really glad you loved it! I want to read it, hope I can soon. Thanks for sharing your thoughts, it makes me wanna read it even more! Okay, you mentioned GM, that’s awesome. As long as it feels like it’s not insta-love, I guess I’ll be okay with it. You will like Oliver. He is so cute that even you will fall for him in less than 24 hours – I know I did ;)) And Hadley is nice as well, with all her insecurities. Something that I really liked and forgot to mention was the dialogue (realistic and funny), so i really hope that it will all work for you as well. I just got this book in at the book store where i work and thanks to your review i will be that much more poorer for wanting to buy it. I love the premise and the cute cover, plus an english boy is always great. Coming back to say that your animated blog header is so cool, Ari! I am mesmerized every time I come for a visit, hah. Thanks Wendy, I feel the same about it. I have to change it a bit to a non-Christmasy winter theme, but between ski lessons and work I didn’t have enough time to think about it (not even to write my last reviews).. and I still have my Christmas tree at home, so it matches my real life too, LOL! I’m really excited to read this one. After your review, I’m even more excited! There is just something about this book that really makes me want to read it now! 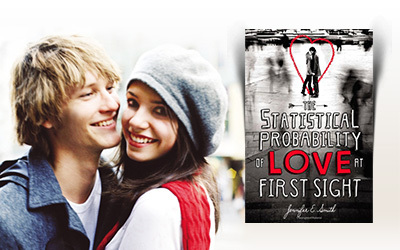 I think it’s the whole understory of meeting someone and falling in love at first sight. *sigh* It’s all the pain and torment that leads up to the HEA that makes it all that much better. Excellent review, Ari! Thanks, Jen. I’ve been waiting for this book for a while and I was really happy to see that it met my expectations. I like love stories, and even though I am quite against insta-love in literature, I always like to read a good book about love at first sight (when it’s done properly). And I was even happier to see that there was more to this story. eep! Thanks for stopping by my blog! I guess I should get on it and you know … read this book 🙂 Everyone is saying such good things about it. Thank you too for the same. I’ve been following your blog for a while. This sounds so whimsical! I can’t wait to read it!! !